April 13, 2011, Auburn Hills, Mich. - Building on the success of last year's Mopar version of the Dodge Challenger, Chrysler Group LLC's Mopar Division will launch a limited-edition Dodge Charger outfitted with select high-performance parts and appearance items straight from the Mopar parts catalog. "The Mopar '11 Charger takes the 'head-turning' factor up a few notches," said Pietro Gorlier, President and CEO of Mopar, Chrysler Group's service, parts and customer-care brand. "By adding some of the most distinctive accessories to an already strong performer, we've created a special-edition car for enthusiasts." Powered by the legendary 5.7-liter HEMI with 370 horsepower and 395 lb.-ft. of torque, the specially equipped Charger includes the "Super Trac Pac" option that pushes the capabilities of the Mopar Charger in acceleration, handling and braking. Already powerful, the 5.7-liter has been tuned to extract the maximum amount of torque from the engine with the inclusion of a specially calibrated engine controller. The controller matches maximum engine power and transmission shifting to the differential for the Mopar '11 Charger. Backed with a proven five-speed W5A580 automatic, Mopar aficionados will appreciate the latest generation "Pistol Grip" shifter combined with Auto Stick. With Auto Stick, drivers may select a higher or lower gear while the transmission controller helps prevent the possibility of an over-rev condition. At the rear, the differential has been boosted up with a new 3.91:1 final-drive ratio for enhanced acceleration -- unique to the Mopar Charger. Initial testing of the Mopar '11 Charger has shown 0-to-60 mph blasts in the low five-second range. Enhancements to the chassis include adding larger front 30mm solid stabilizer bar and rear 20mm solid stabilizer bar, increases from 27mm and 16mm (respectively). Adding to the overall stability and handling of the Mopar Charger are cross-car braces located at both the front and rear shock towers. For increased luggage space, the rear tower-to-tower brace may be easily removed. Specific-design, 20-inch x 8-inch Envy wheels are fitted with Goodyear F1 Supercar 245/45ZR20 tires at all four corners. Wheels are a five-spoke design with a 45mm offset, include specific Mopar center caps and are finished in a high-gloss black complementing the overall "Pitch Black" exterior finish of the Mopar Charger. Excellent stopping power is provided through vented rotors measuring 345mm x 28mm up front that are fitted with dual-piston, sliding calipers. At the rear, vented rotors measuring 320mm x 22mm, coupled with single-piston calipers are used. Available only in a "Pitch Black" finish, exterior highlights of the Mopar Charger include a pair of specific Mopar Blue racing stripes running from the front air dam across the hood and over the roof ending at the bottom of the rear fascia. Ornamentation is limited to a front grille and rear-deck Mopar badge. A rear spoiler is standard on the Charger special-edition model. Inside, unique Katzkin leather seats are stitched in Mopar Blue thread. The leather-wrapped steering wheel is identically trimmed. Engine-turned instrument bezels and a special identification plaque identifying the vehicle as part of a limited edition of 1,000 are affixed to the instrument panel. Owners also receive a custom Mopar key fob badge. Bright pedal covers, premium floor mats with the Mopar logo and front-door sill entry guards featuring the Mopar logo also are included with the package. Mopar will build 1,000 units, 900 for the U.S. and 100 for Canada. The vehicle will be built in Brampton, Ontario, and completed at an upfit center in Windsor, Ontario. The Manufacturer's suggested retail price for the limited-edition Mopar '11 Charger is $39,750, which includes destination fee. 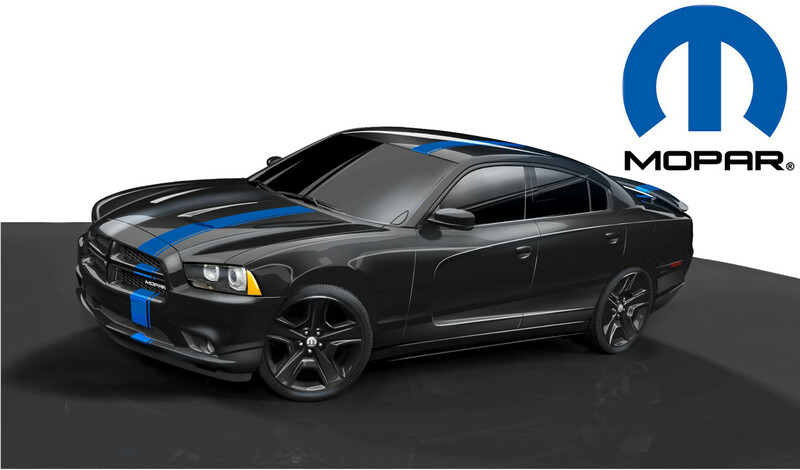 Customers who purchase a Mopar '11 Charger will receive a personalized owner kit in a customized Mopar '11 box. The kit will include a certificate with the vehicle identification number (VIN), exact date of manufacture and the number of the vehicle. The kit will also include a brochure that highlights the unique features of the vehicle, exclusive Mopar '11 merchandise. Mopar is Chrysler Group LLC's service, parts and customer-care brand. Mopar distributes approximately 280,000 parts and accessories in more than 90 countries and is the source for all original-equipment parts for Ram, Dodge, Chrysler and Jeep vehicles. Mopar parts are unique in that they are engineered with the same teams that create factory-authorized vehicle specifications for Chrysler, Dodge, Jeep and Ram Truck vehicles, a direct connection that no other aftermarket parts company can provide. Mopar (a simple contraction of the words MOtor and PARts) was trademarked for a line of antifreeze products in 1937. It also was widely used as a moniker for the CMPC. The Mopar brand made its mark in the 1960's -- the muscle car era. The former Chrysler Corporation built race-ready Dodge and Plymouth "package cars" equipped with special high-performance parts. Mopar carried a line of "special parts" for Super Stock drag racers and developed its racing parts division, called Mopar Performance Parts, in order to enhance both road and racing use.